Of course! Your board has been added! Every Wednesday Unless there is a notice up. with your Weekly Dose of Humpday Madness. I'll be playing the tunes of Yesterday and today. And you never known what I will say on Air! So Join me on Wednesdays! We at ReVo are so happy to have you as an affiliate! ReVo would like to extend this offer to all of you so that you can come experience everything that is available to cater to your online fantasies through roleplay. Just bring this Affiliate Token for a FREE room and 3 months of membership time to the site. To redeem this offer, head to our ReVo Forums to register and fill out the template. Come join in the ReVolution today! - Offer available only to those over the age of 18. 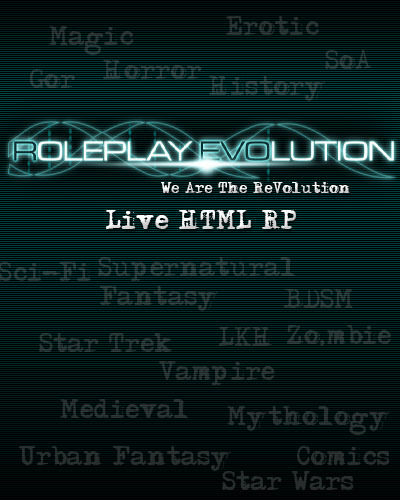 Roleplay Evolution is an HTML chat site, filled with creative chatters who gather around roleplay with themes such as Sons of Anarchy, erotica, fantasy, Gor, historical, science fiction, supernatural. Do come and visit! At Art Garden, we believe in growth and community. That is why we want to be part of a network, connect and make friends with other sites and communities. We want to plant seeds, and make sure that our garden and community continues to grow. If you want to affiliate with us, please leave a post on this board with a link to your site / community / room. Feel free to grab one of our graphics to display on your end.